"My hamster rarely uses it's wheel, what should I do?" We want by the next day and the answer was immidiately clear to us: The hamster wheel was simply too small. The Syrian was running with an arched back, which is painful and can lead to spinal injuries. Instead, we purchased our number 1 pick below and now, Cookie the Hamster, is enjoying life life to the fullest. PS: If you're in a hurry you can see our top-3 picks right here. So, what is the best hamster wheel for exercising? 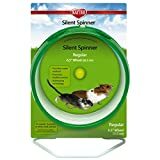 After researching more than 20 hamster wheels, interviewing vets, and seeing hamsters run on the wheels we think the Silent Runner 9" - Pet Exercise Wheel is the best hamster wheel for most people (and their pets). It is not just a name – it is truly silent! If you are looking for a wheel that won’t keep you up at night and will let you sleep in peace, you’re looking at the right product. This wheel has an innovative rolling-ball-bearing design that makes it run smoothly and silently. A lot of hamster owners have testified to that. You will also be relieved to know that it is free from the center axle which is a cause of injury for our little critters most of the time. The recommended size for a dwarf hamster is at least 6.5” while for large ones, the minimum is 8”. Although this wheel is ideal for larger hamsters like the Syrian hamster, also known as “teddy bear”, smaller sized hamsters can also give this wheel a shot. You can purchase additional tracks to give your pet a variety of surfaces to run onto. These additional tracks will help the wheel to prevent slips and accidents. It will also be beneficial in keeping your pets nails neat. Aside from the Exotic Nutrition’s Silent Runner, the Wodent wheel is also one the top picks when it comes to hamster wheels. It is ASCPCA-approved, it’s quiet and comes with a stand made of steel so your pet won’t easily push it over. Since this wheel is quite huge, Syrian hamsters can benefit most from it. It is not recommended for small sized hamsters such as robo, winter white and the like. It may be too big for them and they may have a hard time running in this. 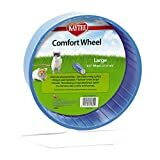 It is an enclosed wheel for your natural wall-hugger pet giving it the security from falling off the wheel, preventing unnecessary injuries. In addition, the middle axle is a large tube-like cylinder to prevent tangles. If you are quite short in budget for the Exotic Nutrition Silent Runner, this wheel is your next best option. This wheel is almost the same as the Wodent wheel Sr. The few differences aside from its size are the holes. The holes of this wheel are rounder which makes it a little trickier to go in and out of it. Also, since it is smaller in size, it also weighs lighter and may tip over. The key is to make sure that you give the correct sized wheel to your pet to prevent that from happening. Speaking of size, dwarf hamsters can fit in this wheel just right as well as large ones. It is made from plastic – easy to assemble and to clean. Just wipe or wash and you’re done. One thing that we don’t like about this wheel is the center axle. It can cause severe injury to your pet. You might feel anxious leaving your pet all night running in this. Unlike the first three wheels, this one is an open wheel. It doesn’t have walls to keep your pet enclosed inside it. The upside is, they will have a much easier access to go in and out. The downside, your hamster can slip and fall out of the wheel while running. Even though it is a solid track and has humps for a better grip, the plastic material might get slippery since it is not a textured track. This wheel measures 8.5” and is best used by huge hamsters like the Syrian hamster. Dwarf hamsters on the other hand, can also try this one out. In terms of the noise, many hamster owners say that his wheel doesn’t really reduce it even with the “whisper quiet operation” label on it. You might be able to save a few bucks purchasing this one but if safety and peace and quiet are your priority, this may not be the best choice. This one is not an enclosed type of wheel as well. It has humps for a better grip while running. However, you should check them for any splinters. Your pet will be running in here probably most of the night so, you have to make sure that nothing will hurt their feet. It is also made from plastic which makes it slippery when wet. In addition, this wheel is ideal for small hamsters only. It is too small for Syrian hamsters or other types of large breed hamsters and may not be good for their back. What we like about this one is the center axle. It is a bolt-like axle and there is less tendency that your hamster’s pet will be entangled. 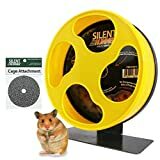 If you are a first time hamster owner, this one is a good beginner wheel. It can help you realize what features of a wheel you should look for in your next purchase. The minimum size recommended for small types of hamsters is 6.5”. This wheel is too small even for dwarf hamsters. Obviously, you should look at other options if you have larger breeds of hamsters. You can choose whether to attach this wheel onto the cage or just let it stand. Also, it is equipped with several humps for a better grip. However, like all the other open wheels, there is a risk that your pet will slip and fall while running since they are too exposed. In addition, The center axle can be a cause for tail entanglement. We do not recommend this wheel. It is too small and doesn’t really feel safe for our pets. For the almost the same price, you can get better wheels than this one. Now, we have just given you the short answer regarding what hamster wheel to pick. However, if you want to venture on your own and find one, or just want to figure out how we know “what is best”, we have outlined our methodology below. You might know this already but if you don’t here’s the thing: Hamsters run - they run a lot and some hamsters run the equivalent of 4 human marathons per night! If not, your hamster will get stressed, restless and will plain simply not live the happy life you want it to have. And if you think a hamster is not truly happy on its wheel, think again. Research has shown that even in nature, rodents will run on a wheel if given the choice because they simply enjoy the activity! Finally, remember that you need as many wheels in a cage as there are hamsters. So if you have 2 hamsters in a cage, you need 2 wheels. When buying a hamster wheel, you need to make sure its both large enough (measured by diameter) and wide enough (measured by the width of the wheel). This is to ensure your hamster doesn’t run with an arched back. Running with an arched back is less enjoyable for your hammy. Further, it will likely lead to back problems for your hamster. That’s why you should get a wheel that’s large enough and it has been a key criterion in our research. For a dwarf hamster, a 6-7 inch wheel is sufficient while an 8-9 inch is sufficient for all but the largest Syrian Hamsters. Finally, some wheels are simply not wide enough for a hamster to run on. This often happens, when the same wheels are sold for both mice and hamsters – mice are significantly narrower across the shoulders and can thus make do with a narrower wheel. As mentioned hamsters run, and they run a lot. That is why it can be very stressful for the hamster owners if the wheel is squeaky or makes monotone sounds when your hamster uses it. That is why it is very important to select a wheel that’s silent. Also, it’s worth remembering that hamsters also have a very keen sense of hearing, so they will enjoy a silent wheel as much as its owners will. How far can hamsters run? Instead, we have to make do with the next best thing, which is observing how much it uses its wheel. Of course, this requires a bit more observation, but it is key in figuring out whether the hamster likes the surface and feel of the wheel. There are many ways for a hamster to hurt itself on a wheel. Some of these include getting tangled up or hurting its spine on a rung in the middle. Further, it can also hurt its small feet if the surface is too rough and it can also hurt itself by falling out of the wheel – especially if it’s a little bit elevated. Finally, having sharp edges in the stand of the wheel means the hamster can injure itself on it even when not using it. All these things point in the direction of having a plastic wheel, as most of these ills are usually not present in a plastic wheel. While there is no right and wrong and both options are good, you probably have a preference for one or the other. Depending on your layout or the number of hamsters in your cage, you will also have more “interior design decoration” options if you wheels can do both. Both wheels we recommend have this ability. 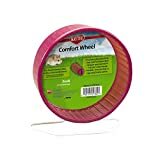 Our top-rated pick for a hamster wheel is the Silent Runner 9" - Pet Exercise Wheel (click to see the price on Amazon) and our budget pick is the Kaytee Comfort Exercise Wheel, 8.5", Large (click to see the price on Amazon).